Knowing the topology of the Fermi surface (FS), in particular its response to an external field, is central to understanding many of the exotic transport phenomena of crystalline solids. In general, the influence of a magnetic field on the Fermi-surface of nonmagnetic materials is disregarded due to the low energy scales of Zeeman energy compared to the typical Fermi energy. But In some specific systems, like high mobility semimetals, it is possible to use the simple magneto-transport methods to describe FS topology. 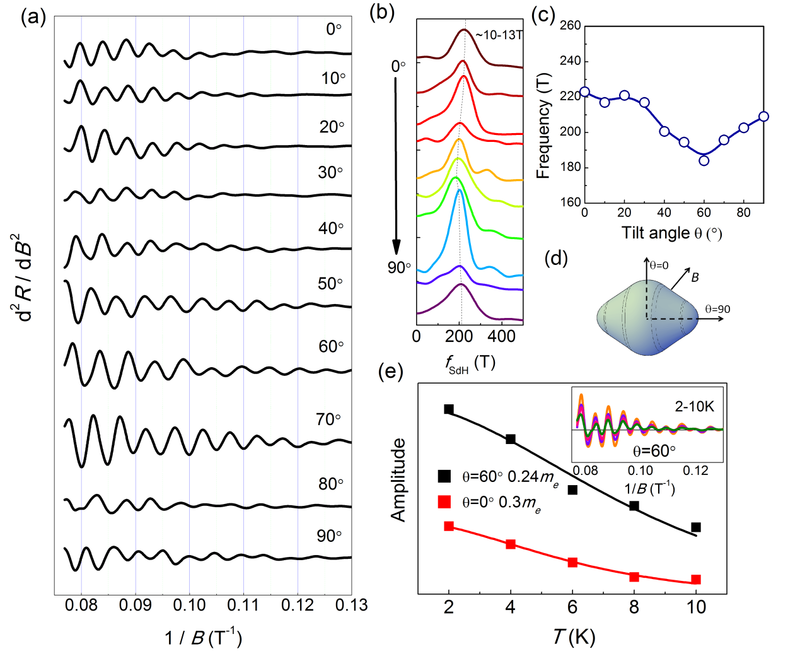 In our recent work, we present an electrical transport description of the Fermi-surface topology and its evolution with magnetic fields in a high-mobility semimetal LuPtBi, which showed highly anisotropic electron Fermi pockets (Fig. 1b). We measured the transverse angular MR by rotating the single crystal sample to the magnetic field while maintaining B⊥I, as shown in Fig.1a. The polar plots of angular MR at T = 300K in Fig. 1c reveal high similarity to the calculated electron Fermi surface. In addition, we observed a symmetry change from six-fold to two-fold rotation in angular MR at lowering temperature and higher magnetic field, which is indicative of some Fermi surface change induced by magnetic field. The data at T = 2K is shown in Fig. 1d below. Angular Shubnikov-de Haas oscillations at high fields showed FS with a lower anisotropic hole-like shape, indicating the absence of electron conduction (Fig. 2). It also suggests some Fermi surface change, like the electron-hole transition, may take place. 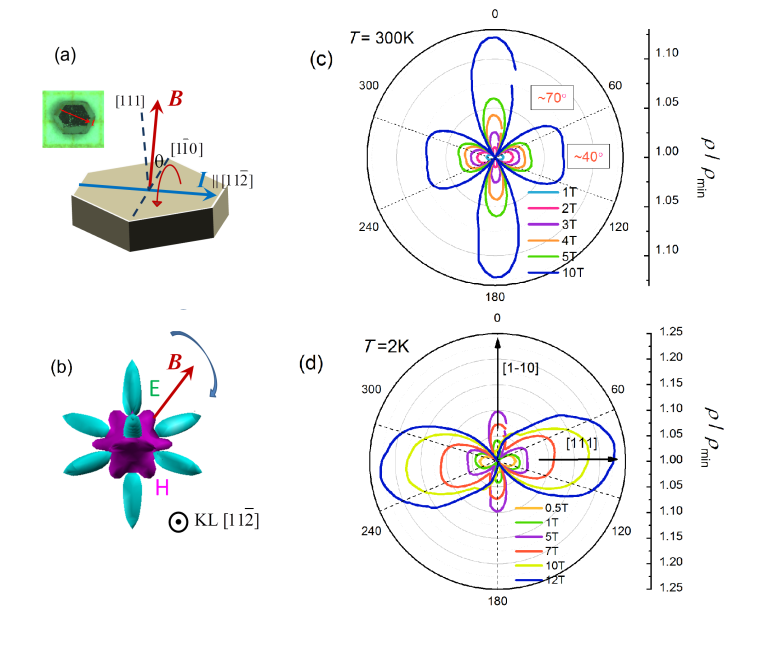 Our results present an elegant description of the Fermi surface via angular transverse MR, and uncover a possible magnetic-field induced Fermi surface reconstruction. The underlying physics may address the controversy of many distinctive field-dependent phenomena, and also raises opportunities for the emerging field-tuning electronic valley occupation. This work is a collaborative research effort between the Professor Wenhong Wang’s group from the Institute of Physics, Chinese Academy of Sciences (CAS) in Beijing and Professor Xi-Xiang Zhang’s group from the King Abdullah University of Science and Technology, Saudi Arabia. Dr Guizhou Xu now works in Nanjing University of Science and Technology (NJUST), Nanjing, China. She obtained PhD from Wang’s group at the CAS in 2016, and specialize in studying the magneto-transport properties of materials, and most recently magnetic skyrmions.